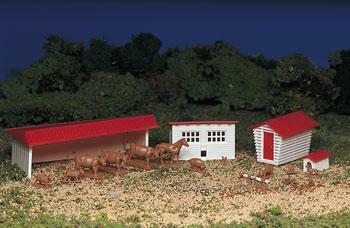 This is an HO Set of a Farm Building with Animals from Bachmann. Retail $23.00 SAVE 37% ! "Lots of stuff for your buck"
Not the greatest, but a good little kit to add detail to your farm scene...I&apos;ll be putting in a cornfield, so the corn-crib worked out great. (Grandson loves the little chickens). Easy to assemble building kit is designed for use with all HO scale layouts. Pre-colored parts (red and white). Animals (horses, cows, pigs, sheep, chickens).